Do you want to enjoy the lucrative benefits of increased sales? Are you focusing on Facebook ads and campaigns for better results? There is no doubt Facebook is the social platform that has been serving as a Booster for businesses; whether large or small. It is an ultimate goal of a business to attract new fans, bring potential customers to their fan pages that go through their sales funnel and transform into regular customers. And this is where Facebook ads add the real essence into the marketing tactics. But many of the marketers or advertisers are frustrated with the results of these Facebook ads. This has created a hot debate in the digital marketing realm, whether to use or not to use Facebook ads for marketing. If you are thinking about the issue that does Facebook advertising work? It is important to realize that Facebook advertisement – just like every other marketing tactic – is an aspect of overall marketing strategy. It is not the core marketing to get everything done for increasing your sales. You have to keep your marketing plan in place first to run Facebook ads and related campaigns properly. This advertising on Facebook for business should be integrated with the core marketing strategy to get worked. But if you rely solely on Facebook ads for enhanced exposure and potential customers, you should have better insights of Facebook ads to see the real picture. It is an undeniable fact that Facebook is a highly engaging social media channel that facilitates your customer or fan following. You can easily drive more fans and followers to your page (or business) through Facebook ads. By following the Facebook advertising guidelines and proper management of Fan page, these advertisements drive real fans and increase your fan base that can ultimately lead to increased sales. Facebook for business is a quick way to target specific demographics and a particular subset of the target market. While running Ad campaigns, you can choose the target demographics and custom audience so your posts will be boosted to generate a higher user engagement. Facebook offers an economical advertising solution. Creating a basic fan page is totally free , even you can add your store to the page for free. But when it comes to Facebook ads, they are quite cheaper than ads on LinkedIn and Google. Undoubtedly, Facebook is a versatile platform allowing multiple options to be played while marketing your brand or services. It allows various forms of media to be easily shared or posted on your Facebook page. You can easily post infographics, videos, share links to YouTube or other such video sites. Similarly, SoundCloud is integrated in Facebook that enables you to post your podcasts, audio lessons or other related stuff that will help you reach target audience. 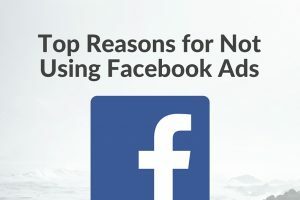 Let us analyze the top most reasons that demonstrate how Facebook advertising is becoming a dead end for you. Why you should not approach Facebook for business and restrict your business from the hassles of Facebook advertising cost. Remember, the Facebook advertising is not a magic wand for your business. Don’t think of this tactic as a magic turning your business into a larger expansion overnight. While running Facebook advertising campaigns, your business needs a complete team to manage the Fan page and online user engagement in order to justify the money you are spending on ads. You need to monitor a number of aspects, like the users subscribing to your page, analyzing the progress of ads, clicks and conversions etc. Once you start using Facebook for business, you have to be synchronized with the Facebook policies and guidelines, procedure and rules. If you own a business page or run advertising campaigns, you need to ensure that your ads are compliant with Facebook advertising guidelines or your page does not violate any of the terms and conditions. This imposes a lack of control over your marketing strategy. And it requires you to be updated with such changing policies to avoid any kind of violations. You must determine the target of running these ads on Facebook? If your ultimate goal is to increase the fan base or enhance user engagement, other multiple social channels might work for you. You may have an enhanced user engagement by managing an interactive blog. Similarly, Pinterest might help you to gain original users through appealing infographics. So, Facebook is not the only option to rely on promoting your services. Instead of spending money on Facebook ads cost, you may have lucrative perks with other platforms for free. Facebook ads cost a lot. Besides spending a huge investing in the form of time and efforts, the Facebook advertisement campaigns need you to invest money out of pocket. This is something that would definitely put a question mark while planning to run ad campaigns on Facebook. Although, Facebook can turn your conversion rate on with its powerful medium. But the average conversion rate for advertising is found to be around 1% mark. This conversion rate is about 50% less than other online advertising options. So, obviously, it is not worth the cost you spend on Facebook advertising. Being on Facebook for business and running ads, you are required to be active. There must be monitoring of the users adding to the fan base, tracking of clicks and impressions, analysis of conversions, responding the comments and keeping an eye on negative comments from customers; all this demands a thorough management. The content is the key to gain users’ attention. Therefore, it becomes crucial to monitor what type of content you are sharing on Facebook. By running ads, you may get a huge fan base but they will not be retained with you if they are not interactive with your brand. You have to spend a luxury time to research what type of posts will leverage you with more exposure.This creates a tedious responsibility of content management. So, you are provided with thorough insights of Facebook advertising. Being a dynamic channel, the advertising on Facebook can be profitable but most of the time it becomes time-consuming, expensive and a tiresome approach to reach potential customers. You are highly advised to plan marketing strategy keeping all these reasons in mind that why you are not supposed to run Facebook ads.